When was the last time you laughed until you cried? This past week, my husband and I reconnected with two couples we have been friends with for over 38 years. At night, we would sit around and tell our favorite "story" about each other or other longtime friends. There was an instant remembering, an instant shared background and vocabulary. We would start laughing and we didn't even have to hear the end of the story. Sometimes we would tell stories on each other that happened while we were apart — but even then, because of our shared history and experiences, we understood the situation and laughed at the funny outcome. As I was planning this weekly update in my head as I do each week, it suddenly reminded me of some of the reasons so many of us are so committed to CASE at both the state/provincial level and the international/national level. When I travel around to our 41 CASE subdivisions, I am always amazed at how similar we all are — at a CASE state/provincial meeting, there is always a legal update, a policy update, content sessions and always time of socializing. During that socializing, there is laughter, hugs, good natured kidding, and just generally a happy close knit social event — even if 400 people are in the room. Why? Because we have a shared history, a shared knowledge base, shared experiences. When you are "catching up" with colleagues you may not have seen since the last CASE meeting, you understand the frustrations, issues, etc your colleagues are talking about even if you weren't with them during the situation, because you HAVE had the same thing happen to you! There are many reasons for being a member of a professional association — but to me one of the BEST ones is that shared camaraderie. As the summer comes, even if you are a 12 month employee, I hope you take some time to reconnect and be revitalized with family and friends and your colleagues at CASE ... we all have so much to offer to each other and we all need to be reconnected so we can be revitalized! Speaking of reconnecting, what a great opportunity to do so with the 12th Annual CASE Educational Legislative Leadership Summit in July! 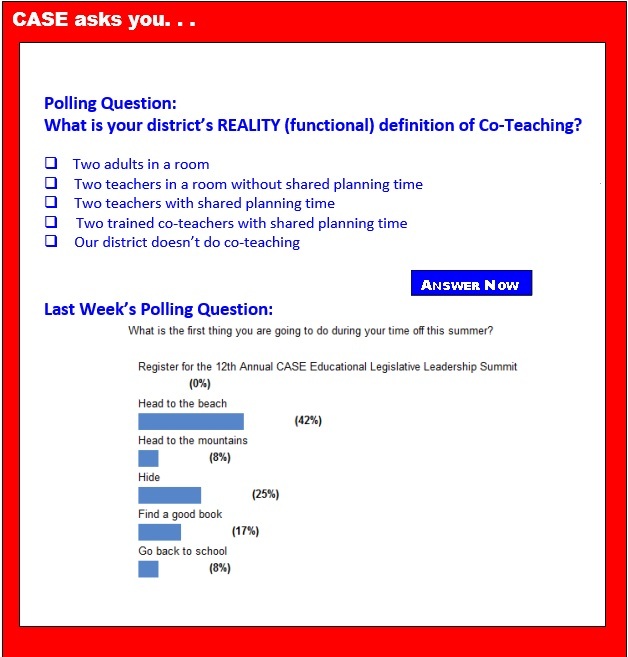 The CASE Educational Legislative Leadership Summit, July 13-16 is a great opportunity for you to reconnect and be revitalized with your colleagues from your state and with those from other states! In case you have come in the past, and we do have lots of repeat attenders, we have changed the schedule a bit this year — we will be starting earlier on Sunday July 13 ... registration will be from 4:00-4:55 and the session will begin at 5:00. We will be done by 7:00, just in time for you to grab some colleagues for a nice evening meal in Old Town, Alexandria! We need every state to have a team attending the 12th Annual CASE Educational Legislative Leadership Summit, July 13-16. Go to the CASE website to register and click here for the flyer. This year as every year, it is very important for CASE to have as many different states represented up on the Hill for our visit on Tuesday, July 15. There are several really important national issues we will be working on in DC this year with our other association partners. Don't miss this great opportunity. And, with a hotel group rate of $149 at the Hilton Old Town, right across from the King Street Metro stop, this might be a great time to do a DC excursion for you and the family! Group rate ends June 17 so click here to make your hotel reservations! Click here to download a flyer. Children identified as intellectually disabled or low IQ learned to read at a first-grade level after persistent, intensive instruction from a scientifically based curriculum, a study shows. Reauthorizing — rewriting — the long overdue Workforce Investment Act, has been cited as a priority for Senator Tom Harkin, D-Iowa, and Representative Eric Cantor, R-Va., leaders in their respective parties. In a "dear colleague" letter, Catherine Lhamon, Assistant Secretary for the Office of Civil Rights at the U.S. Department of Education, wrote to remind charter schools that Federal civil rights laws, regulations, and guidance apply just as they do to traditional public schools. Each of the visual arts, music, and dance activities Elizabeth Rosenberry engages in daily with her 2nd graders has a critical underlying goal: eye contact. The veteran teacher opens class by crouching in front of a student and gently clutching his arms. "Zachary, look at me," she sings, matching his wide-open eyes with her own. The two paraprofessionals assisting in the classroom at the public school, P4Q @ Skillman, encourage the other five students, also seated in the semicircle, to watch the interaction and sing along. A program aimed at reducing behavior problems in order to boost academic achievement has improved performance in math and reading among low-income kindergartners and first graders, according to a study by researchers at New York University's Steinhardt School of Culture, Education, and Human Development. Their findings, which appear in the Journal of Educational Psychology, point to the value of well-designed interventions to improve education, the study's authors say. Dysgraphia is a biological condition that can make many aspects of writing difficult. But it can affect children socially, too. Here are four common social challenges your child may face — and what you could do to help. The bipartisan overhaul of the Workforce Innovation and Opportunity Act trumpeted in Washington, D.C., includes provisions aimed to help students with disabilities find well-paying work, but some say the deal doesn't go far enough. Recently, Sens. Tom Harkin, D-Iowa, Patty Murray, D-Wash., and Lamar Alexander, R-Tenn., along with Reps. John Kline, R-Minn., Virginia Foxx, R-N.C., and George Miller, D-Calif., announced a sweeping bipartisan, bicameral deal that was long in the making. The bill aims to modernize the 1998 law, which oversees $3 billion in job training programs, by eliminating 15 programs and creating universal performance metrics. Many expect it to advance. Only a few years ago, the ambitious initiative to use shared assessments to gauge learning based on the new Common Core standards had enlisted 45 states and the District of Columbia. Today, the testing landscape looks much more fragmented, with only 27 of them still planning to use those tests in 2014-2015, and the rest opting for other assessments or undecided, an Education Week analysis shows. In a nationwide settlement of a San Francisco lawsuit, the administrator of the admissions test for prospective law students agreed to stop notifying schools that a test taker has disabilities and to ease its restrictions for accommodating disabled students. The settlement also includes $6.73 million for 6,300 disabled students who have applied for extra time for the exam and other accommodations over the past five years. Another $2 million in compensation will go to individual students and the state and federal governments, which took part in the suit. In a 2011 National Crime Victimization Survey, close to 1.2 million students reported that someone was hurtful to them at school once a week or more. This rate has not significantly declined since 2005. Of this number, close to 540,000 students say this happens "almost daily." Furthermore, over 700,000 students reported they were "fearful of attack or harm" at school "sometimes" or "most of the time." It's clear: What schools are doing to stop bullying isn't working. And the risks of liability or an agency enforcement action are increasing. When parents find they have a two-year-old who can read, or a five-year-old who wakes up talking about square roots, the task of ensuring that these exceptionally bright children get the educational nourishment they need is unchartered territory. The path can be frustrating for the kids, and worry-inducing for the parents. But the ongoing boom in online learning opportunities has been a great benefit for many gifted youth because the offerings can cater to a student's ability rather than age. How can today's teachers inspire their students? Where does true engagement in learning come from — and how can technology play a role? These questions were the focus of a unique professional development event held in Dallas, during which attendees heard from an all-star lineup of educators. For the past few years, the new nationwide Common Core state standards have been slowly rolling out in Florida's schools. Next year, all schools will fully implement the standards, which lay out what students are expected to learn in reading and math in kindergarten through twelfth grade. It's led to big changes for teachers, many of whom are throwing out lesson plans and cherished writing assignments and learning new ways to teach the basics, like multiplication. The Hechinger Report's Jackie Mader visited one rural panhandle elementary school to see how the standards are changing writing instruction. Children identified as intellectually disabled or low IQ learned to read at a first-grade level after persistent, intensive instruction from a scientifically based curriculum, a study shows. The findings of the pioneering four-year study raise expectations for all struggling readers, said the lead author. "We shouldn't give up on anybody. These children can learn not only functional skills, but reading as well, giving each one a shot at a more independent life."